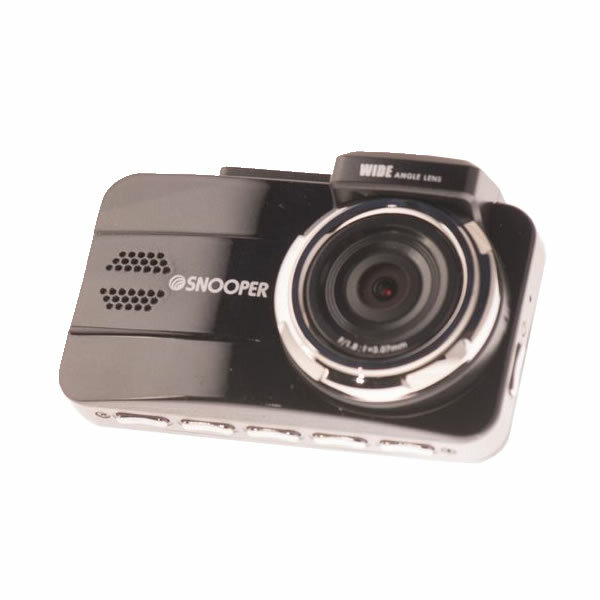 Snooper DVR-5HD is a 2 channel 1080p Full HD dashboard camera with front and rear cameras. Speed camera locations are also available as an optional download for the Snooper DVR-5HD. 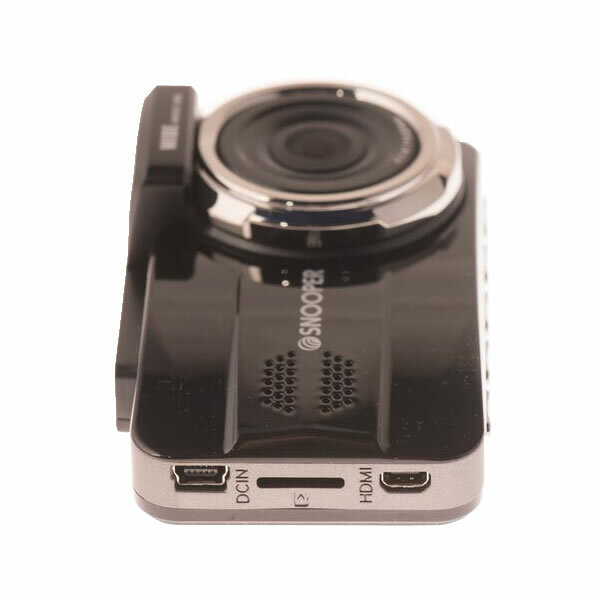 The latest dash cam from Snooper features a 3-inch touchscreen for instant playback of video recorded. A 32GB microSD card is included in the box. The recording angle of the Snooper DVR-5HD is 155 degrees (front camera) and 130 degress (rear camera). GPS technology records date and time stamp to help with insurance purposes. Forward-facing collision and lane departure warnings and driver fatigue warnings are also provided. 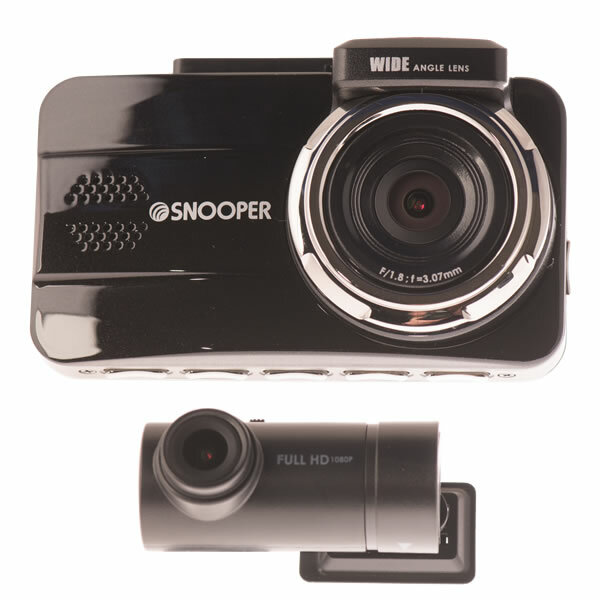 Snooper DVR 5HD is a dash cam. 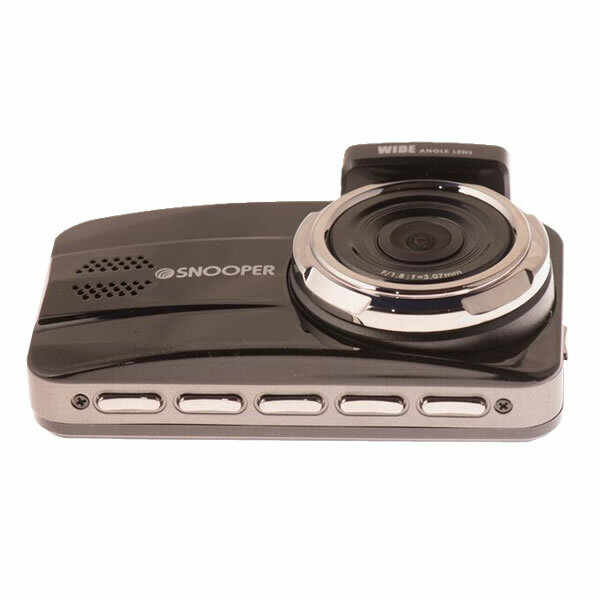 The Snooper 5HD has a 3-inch LCD to instantly view video recorded. Protect your no claims bonus with the Snooper DVR-5HD. There are many cases of false insurance claims whereby people carry out scams to claim on their insurance. The DVR-5HD will provide evidence as to who was at fault leading up to and during an incident or accident. There is a wide viewing angle of 155 degrees for recording on the Snooper front dashboard camera. The rear dashboard camera has a 130 degree viewing angle. Plus the windscreen mount rotates 360 degrees so that you can adjust the mount to record any view of the road that you choose. 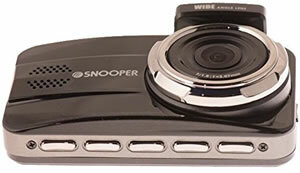 The Snooper DVR-5HD features a built-in battery which is designed to be used when your vehicle is parked. When motion is detected, the DVR-5HD will record and the device sleeps when motion is not detected. The battery life is not suitable for powering the device for continuous recording mode. The Snooper DVR-5HD gets the GPS speed camera data from the Snooper AURA speed camera database - subscription fees and connection to your Windows based PC apply. The database provides advanced warnings to known fixed and mobile speed camera locations across the UK, Europe and in a growing number of other countries across the world. Do you have a question about the DVR-5HD that's not been answered on this webpage? Please see our Dash Cam FAQ's for questions from other people. If the answer to your question isn't featured, use the online form to ask us for the answer. Alternatively please telephone 01733 777623 Monday to Friday (9:30am-5:00pm) to speak to one of our sales team. For further information online please see the Snooper dash cam comparison table. 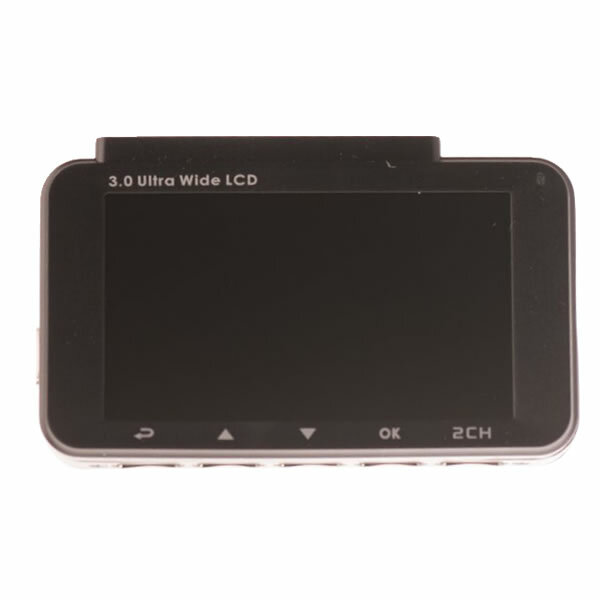 Installing the DVR 5HD device on the included windscreen mount near the rear-view mirror achieves the best performance. The car power adaptor cable can then be trailed around the top of the car windshield and down the side of the car to the cigarette lighter socket. 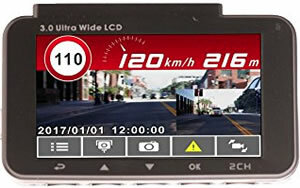 Whilst the DVR-5HD features a built-in battery, this is designed for Motion Detection mode (please see page 33 of the user manual for more details) when the vehicle is parked. The Snooper DVR 5HD will only operate on Windows computers. Specifically, you must be using Windows XP (32 bit), Windows Vista, Windows 2000, Windows 7, Windows 8 / 8.1 or Windows 10. Additionally the software will only work with Internet Explorer 8 or Firefox 10 or above. Included in the Snooper AURA database are speed camera locations in the following countries: Australia, Austria, Belgium, Bulgaria, Canada, Denmark, Finland, France, Germany, Italy, Luxembourg, Netherlands, New Zealand, Norway, Poland, Portugal, Republic of Ireland, Romania, Russia, South Africa, Spain, Sweden, Switzerland, United Kingdom (UK), United States of America (USA) and is still growing. Please note: No USB cable is included, however the USB cable that is required is a micro-USB cable. Question: Can I install the Snooper DVR 5HD rear camera on the outside. I want it as parking camera but I am not sure that it is the best choice for that? In addition the Snooper DVR-5HD is not designed as a reversing or parking camera. When you select the reverse gear in your vehicle the Snooper DVR-5HD screen will not automatically switch to show you the view from the rear camera and view from behind your vehicle. The reversing/parking camera that we sell is the Garmin BC 30 Wireless Reversing Camera. The Garmin BC 30 is for use with compatible Garmin sat navs ONLY. It cannot be used on its own. 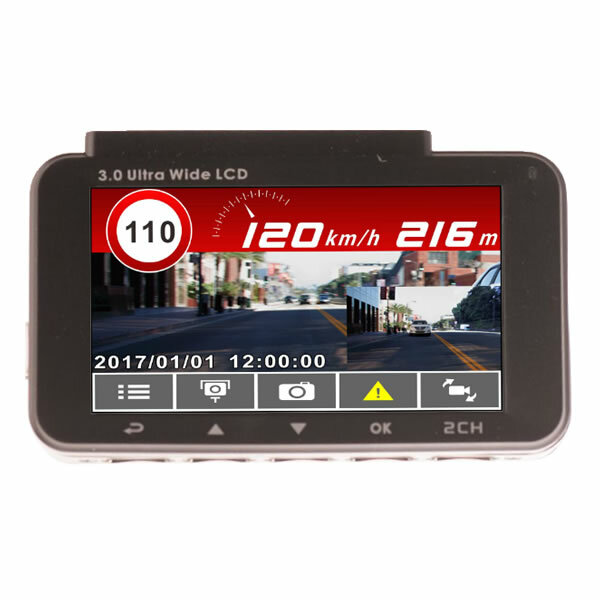 We list the compatible Garmin sat navs that the BC 30 reversing camera will work with along with more information here. Do you have a question about the Snooper DVR-5HD? Submit your question via our contact page.